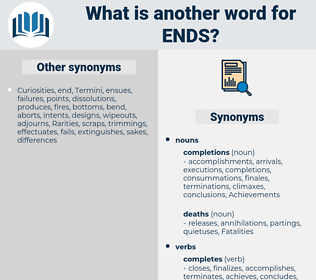 What is another word for ends? endings, destinations, terminations, ceases, Intentions, Extremities, ending, endpoints. means, stalls, halts, stops, shuts, uses, blocks, slips, purposes. 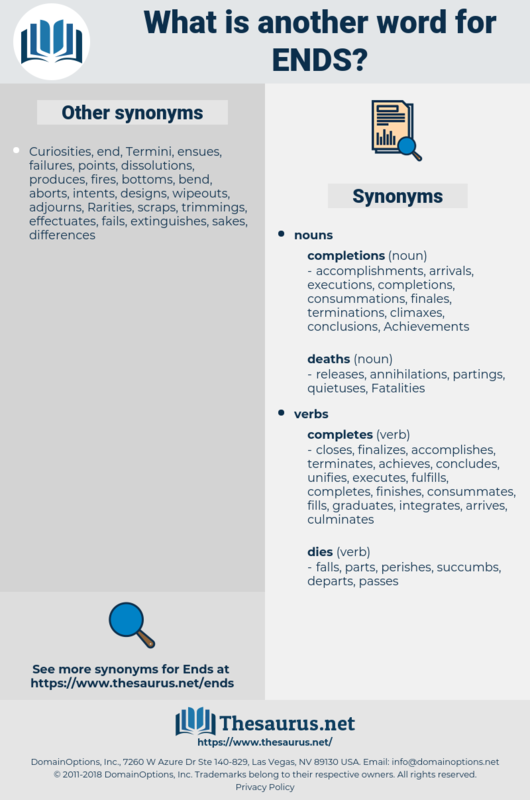 wound, Until, SME, till, up, concluding, cuts, finish, finishes, purpose, purposes, terminate, concluded, closing. weekends, needs, conditions, confines, heading, deadlines, directions, implications, repercussions, ramifications, specifics, engagements, participate, considerations, operations, expectations, consequences, agendas, matters, idiots, deliberations, Concentrations, edges, engines, corners, effects, requirements, intent, intents, final, finals, advantages, elements, outcomes, preconditions, perspectives, findings, respects, outskirts, frontiers, indications, channels, details, dimensions, motivations, objective, objectives, over, Aspirations, closings, deductions, means, names, interests, components, reflections, economics, pointes, sides, designs, persuasions, deadlocks, quarters, strands, expression, kinds, proceeds, targeting, mouthpieces, aspects, monies, meanings, fins, points, things, sections, stalemates, issues, fringes, objectifs, terminals, borders, particulars, extremes, Angles, faceplates, terms, living, sens, Appointments, depths, reasons, benchmarks, target, targets, segments, portions, senses, weeds, Boundaries, spikes, benefits, threads, scorers, holdings, funds, dilemmas, spines, lengths, premises, banks, ways, fonds, blades, ambitions, timetables, words, grounds, fractions, Moieties, margins, results, stripes, optics, Lenses, stops, logjams, profits, uses, objects, motives, returns, thoughts, MDGS, recitals, parts, places, fines, subjects, shards, limits, IMPACTS, making, colours, applications, PAGES, tubes, functions, searches, rails, scraps, souls, flanks, peaks, hoses, aims, pieces, shores, Ones, fronts, goal, Goals, title, causes, lapses, thrusts, portals, pipes, finnish, tasks, hoops, ideals, pleas, outputs, aliquots, account, dates, pursuits, items, blocks, Tracks, CAMPS, Gains, limbs, club, clubs, Boils, bits, Grips, locks, PORTS, bushes, Parties, LINEs, Plays, safes, finishes, purpose, purposes. spends, intends, discontinues, determines, includes, rescind, rescinds, Dies, finalizes, investigates, declares, incorporates, eliminates, engages, culminates, stands, disposes, commences, perspective, cancels, begins, disappears, implements, entails, suspends, separates, outcome, identifies, expiring, expires, exists, undertakes, negates, removes, stop, complement, complements, germinates, arrives, excludes, supercedes, resides, involves, supersedes, finds, continues, supplements, decides, destroys, departs, explores, succeeds, extinguishes, enters, inquires, likes, Leaves, nullifies, conducts, is, calculates, generates, happens, graduates, wraps, splits, vanishes, kills, adopts, prohibits, fades, sets, reverses, severs, matures, moves, implies, resolves, serves, pursues, exits, remains, starts, argues, becomes, forbids, scale, breaks, turns, Comes, repeals, appears, performs, files, Empties, establishes, revokes, annuls, submits, proves, avoids, voids, final, works, outcomes, reaches, hikes, total, shares, occurs, objective, objectives, lead, leads, drops, produces, arrest, arrests, fills, means, holds, Drives, cures, occupies, seeks, amounts, proceeds, brings, Carries, keeps, lifts, pauses, lasts, takes, hits, fins, points, Focuses, creates, boosts, draws, logs, seals, camp, passes, heals, targets, latches, attacks, stalls, meets, always, flows, bars, wins, goes, slams, runs, halts, results, optics, stays, whips, stops, shuts, uses, raises, falls, places, K, wants, gets, puts, aims, goal, Goals, cut, causes, Does, Boils, locks, 's, Plays, up, cuts, finishes, purpose, purposes, closing. 466. important ends of a mixed government, i.
emit, emote, eminent, EMDA, emydidae, emanate, ennead, endow, ended, emended, enate, endowed, endue, enid, emend, emmet, enmity, endued with, emmanthe.